Nearly two-thirds of workers say they are contributing less to their 401(k)s because of rising health costs, according to a new survey. In 2016, employees using both a 401(k) and HSA saved an average 10.6 percent of their salary, according to a recent study. Don't skip that annual physical. How healthy you are could have a big impact in your ability to save for retirement — and, later, to enjoy it. Nearly 1 in 4 adults say they or a family member have avoided seeking medical attention because of the cost of that care, according to a recent Bankrate.com survey. "People across the board, regardless of the coverage they have, seemed to have a high level of health-care insecurity," Robin Saks Frankel, credit card analyst at Bankrate, told CNBC. "They are concerned about the quality of coverage and the costs associated." Nearly two-thirds of workers say they are contributing less to their 401(k) plans because of rising health-care costs, according to a new survey from Bank of America Merrill Lynch. 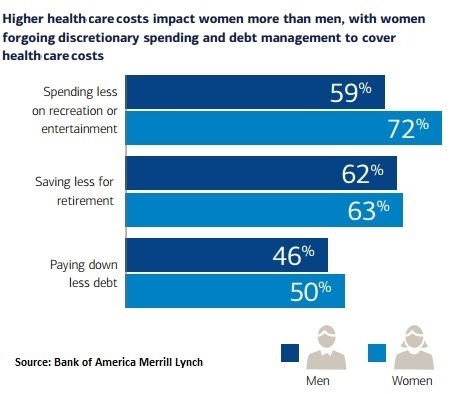 "Financial stress caused by rising health-care costs is affecting other goals people have, like retirement," Kevin Crain, head of workplace financial solutions at Bank of America Merrill Lynch, told CNBC. Strategically using a health savings account in conjunction with your 401(k) may help. HSAs let workers make tax-deductible contributions, which can be invested and grow tax-free. They can also be withdrawn tax-free for qualified medical expenses. In 2016, employees using both a 401(k) and HSA saved an average 10.6 percent of their salary, according to a recent Fidelity analysis. Workers who just saved in a 401(k) set aside an average 8.2 percent. Fidelity also found that 88 percent of people who opened an HSA maintained or increased their 401(k) savings after their HSA enrollment. Many workers expect to stay in their job until at least age 70, and then retire to an active agenda of travel, hobbies — and even more work, via an encore career or entrepreneurship, according to the Aegon Retirement Readiness Survey 2017. But nearly half of those surveyed are taking only a few steps (if any) to stay healthy and achieve those goals. "We focus so much on the financial aspects of planning for retirement, but we do relatively little to prepare ourselves from a health perspective," Catherine Collinson, executive director of the Aegon Center for Longevity and Retirement, told CNBC. Poor health ahead of and into retirement could mean you'll face higher health-care costs in retirement, or face income shortfalls if health issues force you out of the workforce. 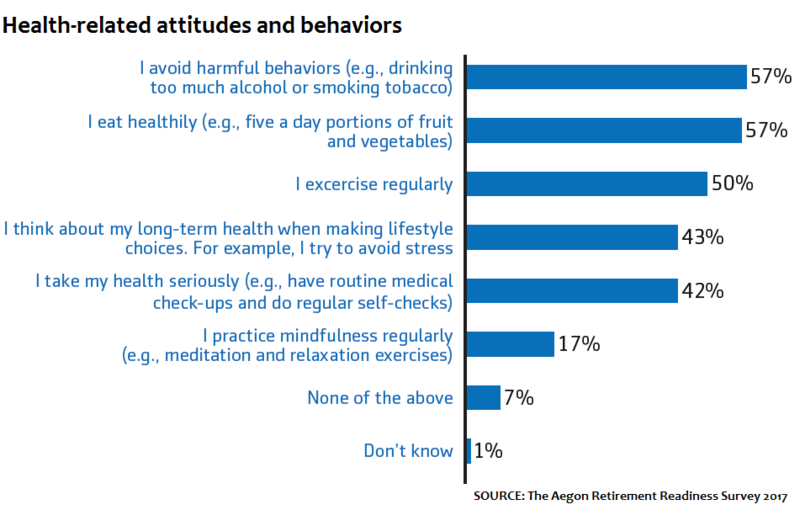 Among U.S. retirees in the Aegon survey, 61 percent said they retired sooner than planned — and 31 percent did so due to poor health. Married couples have dozens of Social Security claiming strategies open to them, and your health and expected longevity can play a big role in which options make sense. Actuarial tables predict there is a 50 percent chance that one member of a healthy 65-year-old couple will live to age 93, said Rob Kron, head of investment and retirement education for BlackRock. "A higher earner should not base his or her strategy on their own life expectancy, but rather base it on the joint life expectancy of the couple," Kron told CNBC. Read more: Married couples have 81 ways to claim Social Security.